Vila Trapez ***offers to the tourists a number of 9 double rooms, all equipped with the most modern facilities, designed to make your stay as pleasant as possible. Any double room can be reserved for single use. Check-in is from 14:00 and room reservations are available until 12:00. On request, the room may be released after 12.00, in which case an additional fee is payable. All rooms have terraces or individual balconies with direct views of the Bucegi Mountains, Postăvarul Peak and Piatra Mare Massif. For the health of our guests, we recommend that you only smoke in specially designed places. Pets are not allowed. We accept payment with Visa and MasterCard. Outdoor Experiences for all nature lovers. Tandem paragliding jumping over this particular mountainous area is very common. The Bunloc chairlift is available for tourists and can go up to the top plateau. See more details at the tourist attractions section or Vila Trapez reception***. Suitable for two people / couple. We offer 2 studios for up to 4 people. Rooms for different kind of presentations. 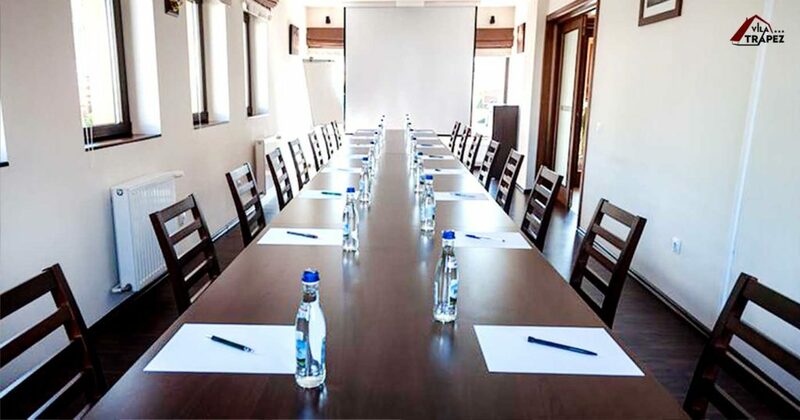 For events, Vila Trapez *** offers a conference room with a capacity of 25 seats in the boardroom arrangement, equipped with videoprojector, projection screen, flipchart and professional sound system. The breakfast room, featuring modular furniture, can be easily arranged in a welcoming and spacious conference room with a capacity of 32 seats in the classroom arrangement and 46 seats in the U-Shape arrangement. The modularity of the furniture offers the possibility to use this room for different types of presentations. For organized meals like: wedding, baptism, corporate or private parties, the breakfast room can be arranged for a maximum of 70 people. The professional sound system can be used by a DJ, which can be made available on request. Massage or coffee break services can be provided on request, just like the room decoration services. The fully equipped conference room rate is 250 lei / day, and the breakfast room can be rented for conferences, at the rate of 350 lei / day. For tourists who just want to enjoy a drink, the terrace and the reception bar are available daily from 08:00 until 24:00.